The 8 Best Gulf Shores Airbnb Rentals You'll Ever Find! 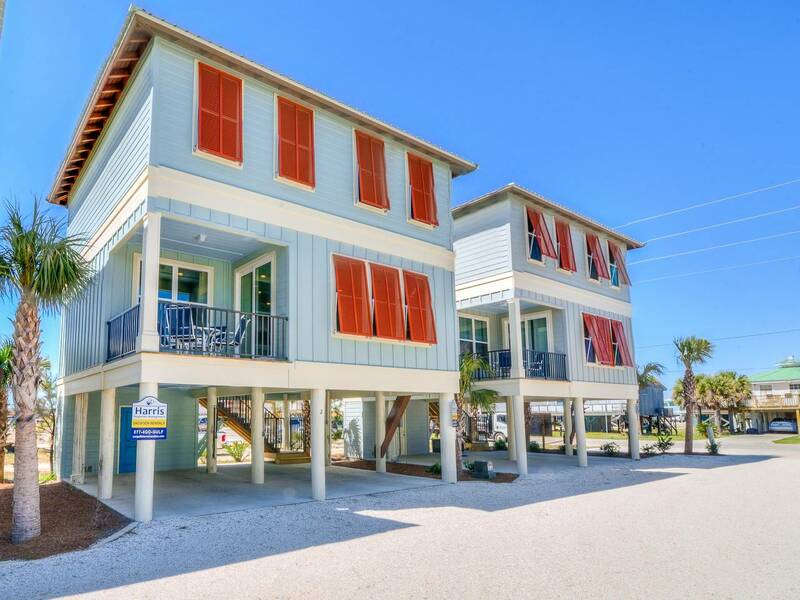 If you’re heading to Alabama’s southern shores summer vacation, you’ll want to find the best Gulf Shores Airbnb rentals available. The Gulf Coast has a lot to offer beachgoers and golfers, but there are so many things to do in Gulf Shores, Alabama that you might not know about. Enjoy Gulf Coast water activities like paddleboarding, fishing, and sailing, try zip-lining over the sand dunes, or bring the kids to Alabama Gulf Coast Zoo for hands-on animal encounters. Especially if you’re coming for Hangout Fest, you’ll want to stay in the best Gulf Shores Airbnb, for sure. Some of the best places to stay on Alabama’s Gulf Coast are Orange Beach, Gulf Shores, and Fort Morgan all the way out to the west. Not to worry, we’ve rounded up all of the best Gulf Shores Airbnb rentals for you below. 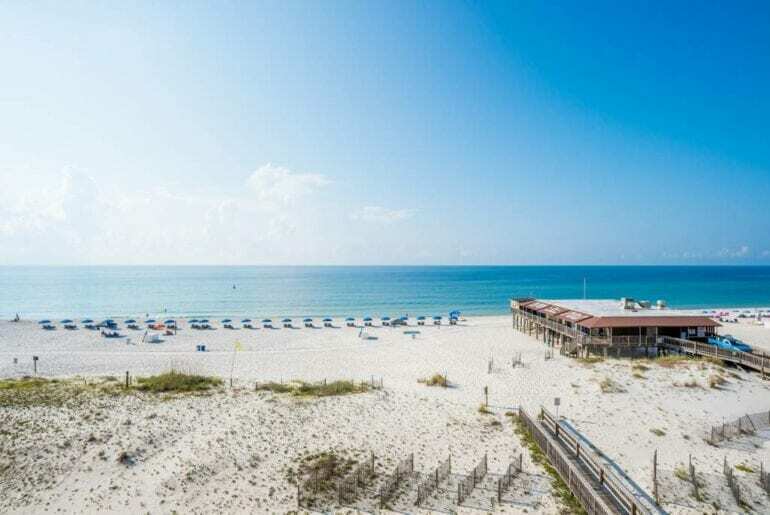 Go ahead and book your next Alabama beach getaway now! 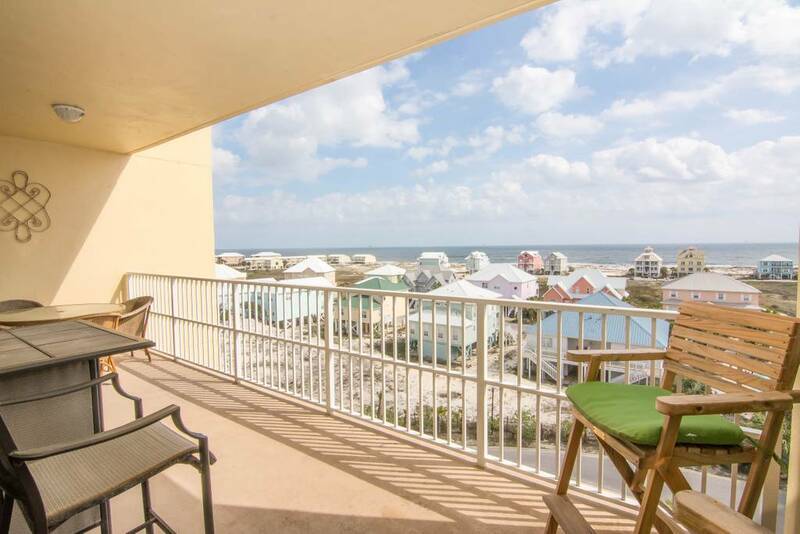 Take in spectacular ocean views from this gorgeous Gulf Shores Airbnb condo. Modern and luxuriously decorated, this vacation rental has a lot to offer in one of the best locations on the Gulf Coast. 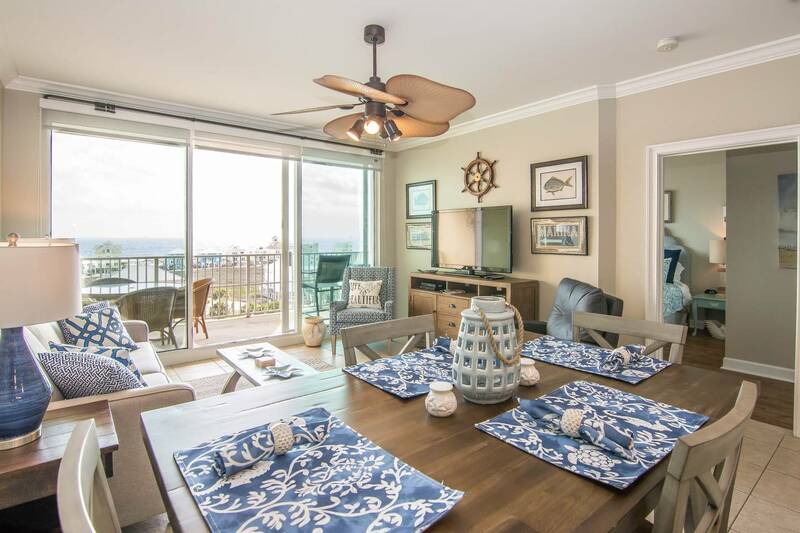 Stay just steps away from the lively boardwalk and buzzing white sand beach, with all the luxury and privacy that comes with a modern condo apartment. This 1,000 sq.ft. home has two bedrooms and two bathrooms, with space to accommodate up to 6 guests including the sofa bed. 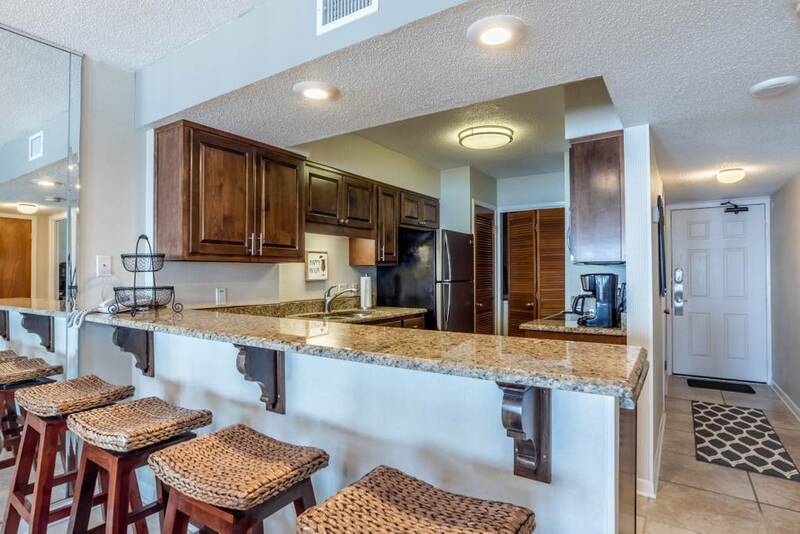 Granite counter tops and stainless steel appliances make the condo kitchen a luxe place to prepare meals, or else the best restaurants in Gulf Shores are just a short walk or drive away. 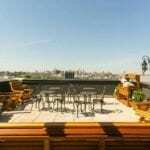 Guests can also enjoy the condo building’s fantastic amenities like a gorgeous swimming pool and outdoor deck. This vacation rental would be ideal for a romantic couple’s getaway or a small family vacation and can be booked for around $250 a night. Walk to Romeo Beach in just 5 minutes from this beautiful new and pet-friendly Gulf Shores Airbnb. This two bedroom, three bathroom home can sleep from 6-8 guests and is available from around $190 a night. Located in a small, purpose-built complex just 150′ from deeded beach access, the house itself is right next to the stunning shared swimming pool. 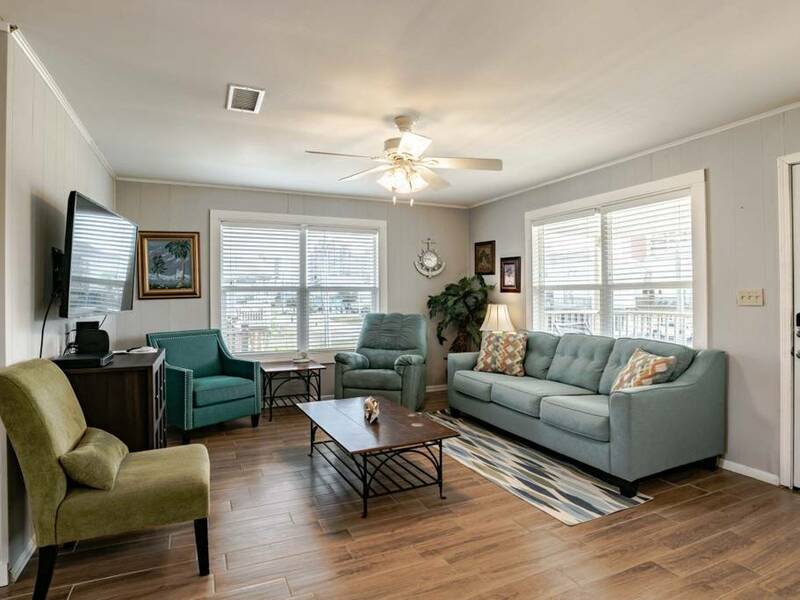 Gleaming granite countertops, enormous windows throughout the living area, and ample space to unwind are just a few of the great benefits of this gorgeous Gulf Shores Airbnb rental. Enjoy your morning coffee or an evening cocktail on the private balcony and feel the fresh ocean breezes rolling in off the Gulf. This is truly Golf Shores luxury living at its finest. 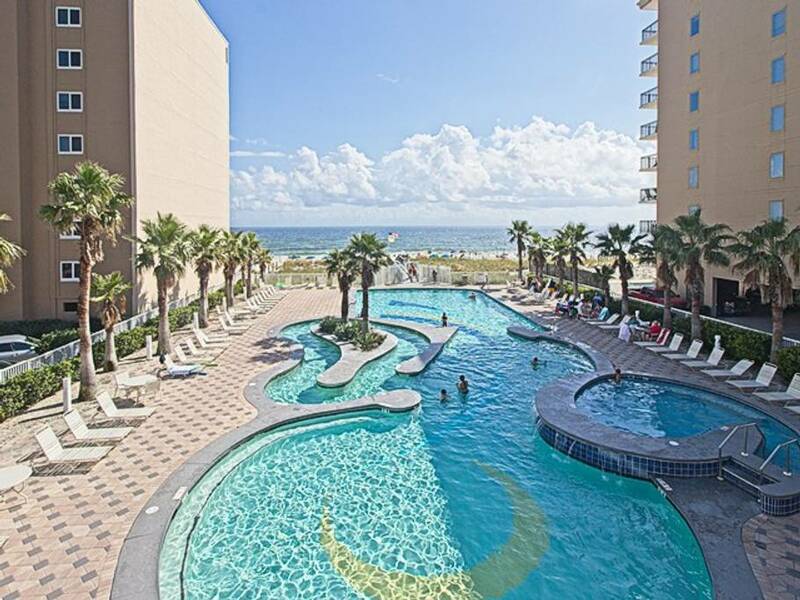 Available for around $289 a night, this luxurious highrise Gulf Shores Airbnb condo boasts an ideal location and lots of excellent amenities. Enjoy full access to the building’s multiple swimming pools, lazy river, hot tubs, fitness center, sauna, and meeting space. Stay right in the middle of the action in Gulf Shores, with great restaurants, shops, and many beautiful beaches all just a short walk or bike ride away. This condo vacation rental has two bedrooms and two bathrooms, accommodating up to six guests including the sofa bed in the living room. Gorgeous ocean views await from this 7th-floor highrise condo, with a pretty private balcony and lots of open living space inside. The sleek, modern kitchen is an amateur chefs’ dream and fully-stocked for your convenience. Here’s the fun-filled family vacation on the Gulf Coast you’ve been looking for! This beautiful Gulf Shores Airbnb near Orange Beach is absolutely perfect for a family with kids and best of all? It’s available from only around $160 a night! The bright turquoise exterior is unmissable and a close match to the Gulf ocean waters nearby. 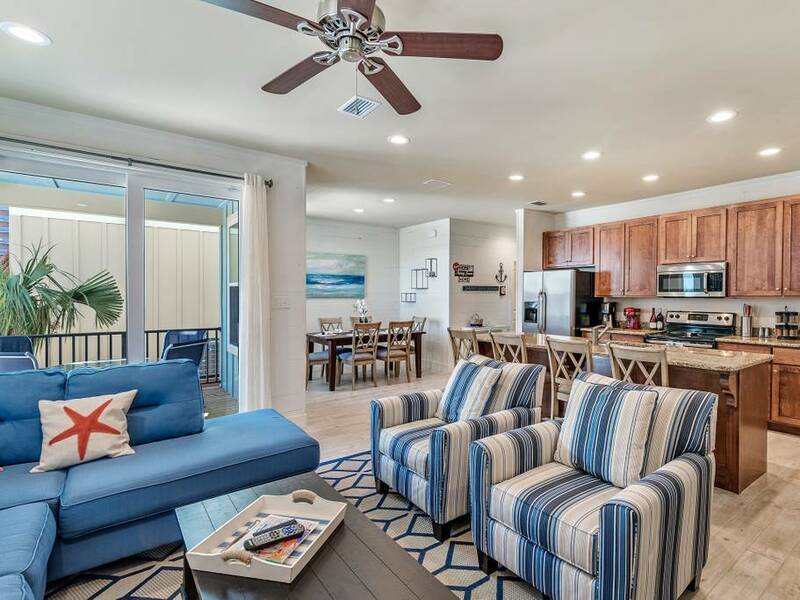 Walk to Orange Beach in minutes, or take a short stroll to the many shops and restaurants near this upscale Alabama beach vacation rental. With a bright, spacious layout and gorgeous architectural details like coffered ceilings, this luxe beach house is sure to impress. There’s room for up to 10 guests with three bedrooms and 2.5 bathrooms, including a room just for kids or teens with a double bed and built-in bunks. Relax on your private balcony to enjoy fresh sea breezes with a glass of wine or host a fun family barbecue on the large back deck. This luxury Gulf Shores Alabama beach house looks like it was plucked from the pages of a design magazine! There’s space for up to 12 guests to stay in style, with seven beds in five big bedrooms, plus four full bathrooms. 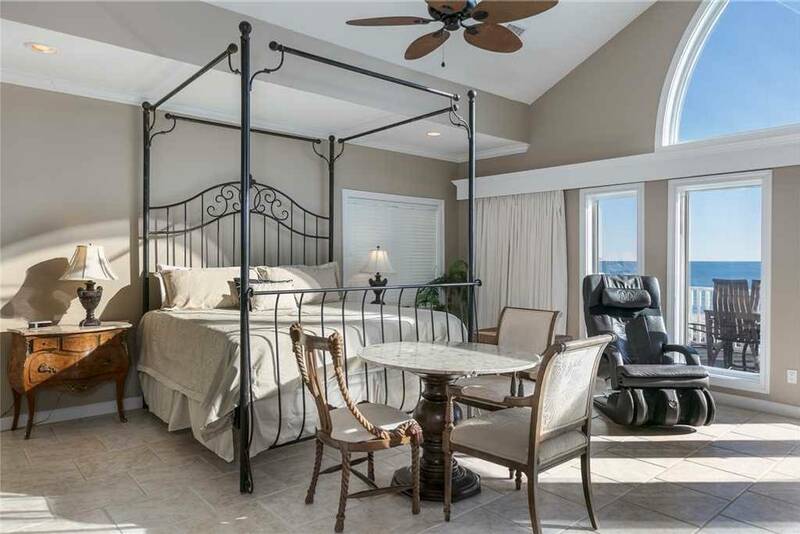 Available for around $425 a night, this spectacular luxury vacation rental is ideally located in the upscale Tannin Village community near Orange Beach in Gulf Shores. 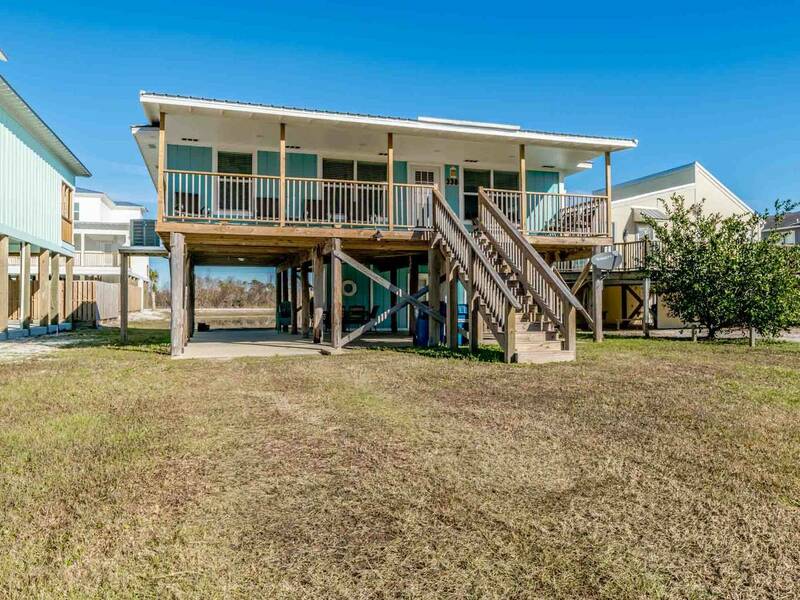 Custom built by a Southern Living designer/builder, this exceptional Gulf Shores Airbnb rental boasts 3,300 sq.ft. of luxury living space in picture-perfect Tannin Village. Walk to the sandy white beaches, pop into town for boutique shopping and quaint cafes, and enjoy access to the Olympic-sized, exclusive community swimming pool. The gorgeous bedrooms include a kid-friendly room with custom bunk beds, while the first-floor master suite has an enviable claw foot bathtub ideal for a luxurious soak after a long day in the sun. 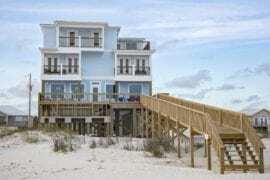 For a bit more peace and quiet on the Gulf Shores, head west, where you’ll find this stunning and unique Fort Morgan beach house rental. 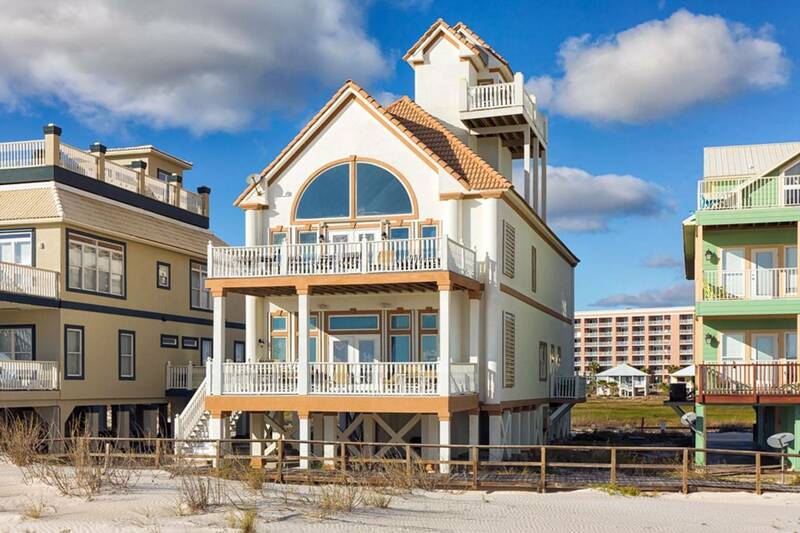 Available from around $700 a night, this quirky vacation rental has an original cupola lookout point accessed from the third floor’s living room, offering truly breathtaking views over the Gulf of Mexico. Multiple sun-drenched balconies and huge windows mean no space in this beach house goes without a beautiful beach view. There’s space to accommodate 16+ guests easily, with six big bedrooms and 7.5 bathrooms. The home’s size and location make it ideal for an intimate beachfront retreat or a small wedding with your closest family and friends. Inside, this Gulf Shores Airbnb boasts light, stylish decor and modern amenities including an updated chefs kitchen. Just a short, 20-25 minute drive from busier Gulf Shores, Fort Morgan is a more peaceful beachside choice for vacationers. 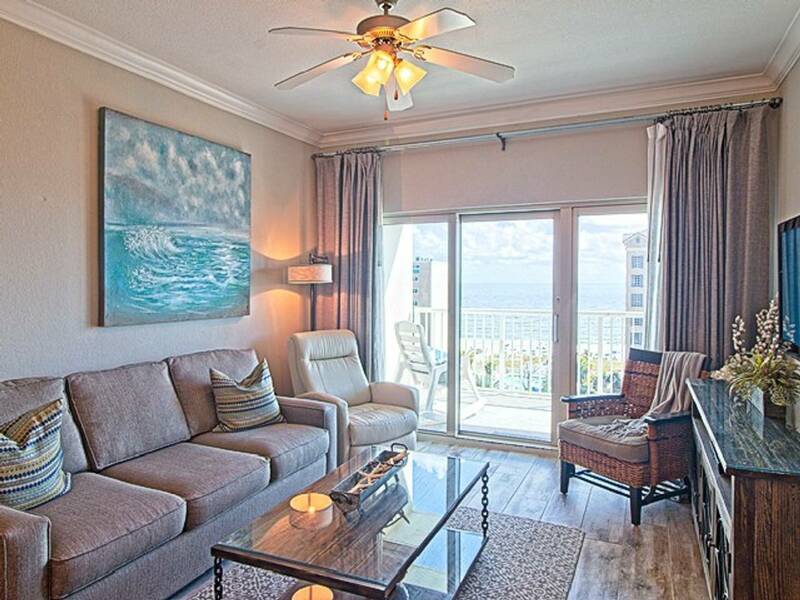 Book this luxurious condo with Gulf views from just around $225 a night. You’re just minutes from the beach, but this fantastic condo building boasts its own large swimming pool and private rooftop sundeck, too! Up to 6 guests can stay in comfort with three bedrooms and two full bathrooms. The interior design of this beautiful Gulf Shores condo near Fort Morgan combines a nautical vibe with high-end furnishings. An open-concept main room is ideal for entertaining together as a group, either cooking something fabulous in the modern chefs kitchen or simply relaxing and watching the sunset with a glass of wine. Finally, one of our favorite Gulf Shores Airbnb homes ever is this cute, modern vacation rental. We love the fresh, modern interiors which include a sleek chefs kitchen with stainless steel appliances. The gorgeous, open living and dining space are ideal for group gatherings or casual chilled-out evenings. With two big bedrooms, five beds in total, and 2.5 bathrooms, this lovely beach house can accommodate up to 10 guests easily. During the peak summer months, it’s available for around $250 a night for weeklong stays so be sure to book in advance! Enjoy all that this great Gulf Shores Airbnb has to offer, including a short walk to the area’s best beaches, shops, restaurants, and more.